The Lockheed F-94 Starfire was the United States Air Force's first operational jet-powered all-weather interceptor aircraft. It's design was an evolution of the twin-seat T-33 Shooting Star. The F-94B remained in USAF service through 1954 before being transferred to the Air National Guard. In ANG service, some were modified with a pod under each wing for two additional .50 in (12.7 mm) machine guns, bringing the total guns to eight. In the F-94C version, the guns were replaced by rockets. Although the nose-mounted rockets were a cool idea, they blinded the crew with their smoke and fire, and in some cases their exhaust could cause a flameout of the jet engine, leading to the loss of the aircraft. To solve this problem, mid- wing fuel and rocket pods were added, each holding 12 rockets. This version of the aircraft was extensively used within the Semi-Automatic Ground Environment (SAGE) air defense system. The first F-94C was delivered in July 1951 and by May 1954, 387 were in service. 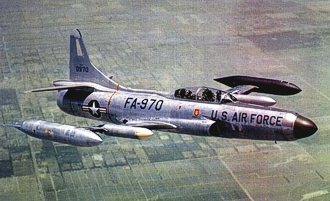 The F-94C was retired from USAF service in 1959, as newer and more capable interceptors entered service. Air National Guard units retired their F-94s during 1960. Between 8:15PM and 10:30PM on Saturday July 26, 1952, Air Route Traffic Control ( ARTC ) radar operators at Washington National Airport picked up several unidentified slow moving targets. They were spread out in an arc around Washington from Herndon, Virginia 20 miles North-east, to Andrews AFB about 10 miles east, where they were also being tracked on their radar. At 11:30PM jet interceptors were requested, and by midnight two F-94s from New Castle County AFB about 100 miles north-east were airborne. Just as the two jets arrived in the area the targets disappeared from the radarscopes. The two jets made a systematic search of the area, but couldn't make a visual or radar contact so they returned to their base. Meanwhile Langley Tower, about 140 miles south began to get reports of weird bright rotating lights of alternating color in the area around Langley AFB near Newport News. The tower operators visually confirmed the sighting and called for an interceptor. An F-94 in the area was visually vectored toward the UFO by the tower operators. The pilot saw the UFO and started toward it when the UFO dimmed and the pilot lost visual contact. The F-94 continued its run and established a radar lock-on, but it was broken in a few seconds as the UFO sped away. The UFOs then reappeared back on the Washington National Airport radarscopes and two more F-94's from New Castle AFB were ordered to the area. When the jets were vectored toward the UFOs, Lieutenant William Patterson, a veteran of the Korean War, found his F-94 surrounded by a ring of bluish-white lights. Patterson radioed for instructions and was not given permission to fire on the UFOs. The UFOS then went into evasive maneuvers, instantly accelerating away beyond range. ARTC vectored Patterson toward another UFO and he made visual contact. He cut in the F-94's afterburner and went after it, but it outdistanced the interceptor and disappeared. After patrolling the area for about twenty minutes, the jets began to run low on fuel and returned to base. 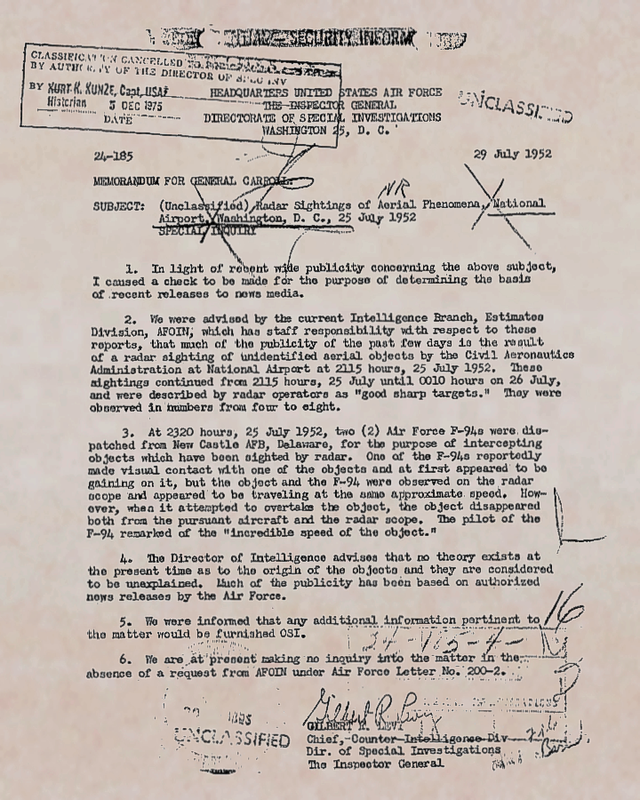 Minutes later it began to get light, and by the time the sun came up all the targets were gone.3 Below is a reproduction of a July 1952 memo by Gilbert Levy, Chief USAF Counter Intelligence Division, which mentions the F-94 intercept. Powerplant: Single Pratt & Whitney J48-P-5 afterburning turbojet engine. See our Editorial Standards for more information on our methodology, how it contributes to the reliability of the information presented, and how to locate source references for some of the details not be included in the citations above. Also check our Suggested Reading links below.